We here at Blatant Media are thrilled to announce the imminent release of Absorb LMS 5.0 – a major upgrade to our multi-award-winning Absorb Learning Management System. The release of Absorb 5.0 positions Absorb as the best LMS for organizations looking for ease-of-use, multi-language support, security, robust functionality and a great user experience at a fair price. “We are very focused on, and invested in, maintaining our leadership position in the industry by delivering new features and technologies in a way that is intuitive and useful for our clients”, says Mike Owens, President of Blatant Media. 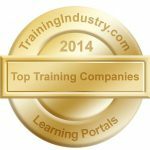 This customer-driven model and constant focus on innovation has led to continued growth and accolades, with the most recent award being the addition of Blatant Media to the TrainingIndustry.Com “Top 20 Learning Portal Company List for 2014“. “It’s super awesome to be on the Top 20 Learning Portal list for the fifth year in a row!” says Mike Eggermont, Co-founder of Blatant Media. For more information on Absorb 5.0, please visit absorblms.com.